It’s the Road Trip which is on everybody’s bucket list and – after driving 500 miles down California’s ever-changing coastline – we now know why the Pacific Coast Highway is so special. The funny part about this world-famous drive is that not many Californians, including Mrs Life of Reilly, have actually experienced it. Most natives opt for a quick flight from Nor Cal or So Cal (slang terms for Northern and Southern California, if you hadn’t guessed?!) or get the job done in an eight-hour drive on the freeway. After “doing” Route One, I don’t think we’ll ever drive the main motorway (Interstate 5) ever again! Sure, it might take a few hours longer but we’d rather be smiling and enjoying every minute, rather than being stuck in traffic or trying not to fall asleep on a dead-straight road, while listening to a boring audiobook your other half put on before she fell asleep. We were really excited about doing Highway One but when we were researching it, there didn’t actually seem to be any websites which offered exact timings so that we could properly plan our trip (to the hour) and work out a realistic itinerary. This is why we’ve written THIS article!! 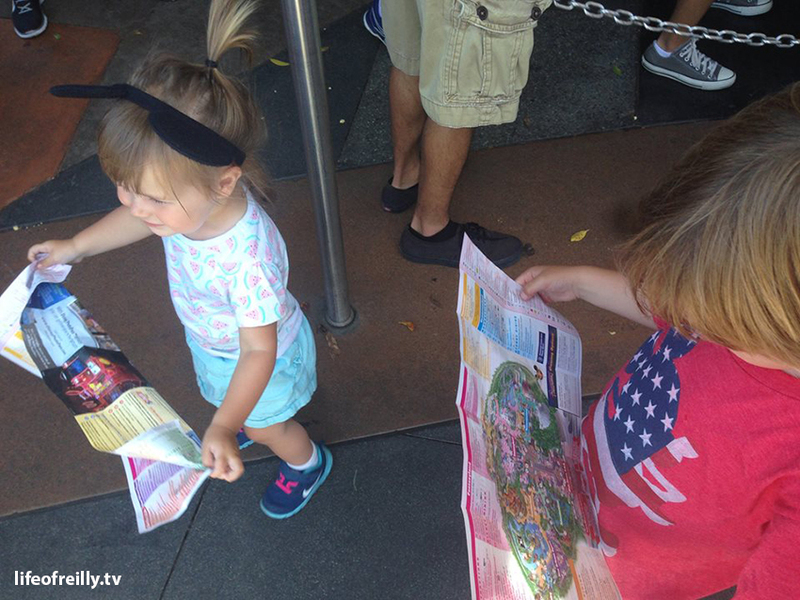 Our timings are real and accurate, because we noted them down as we went along. On the left you’ll see our real timings, but we’ve put our suggested times in brackets (plus a full itinerary at the end of Day 3), which will help you avoid the problems we had each day. If only we’d read our blog before we travelled!!!! So, here’s how we did Route One, with two kids, over three days! 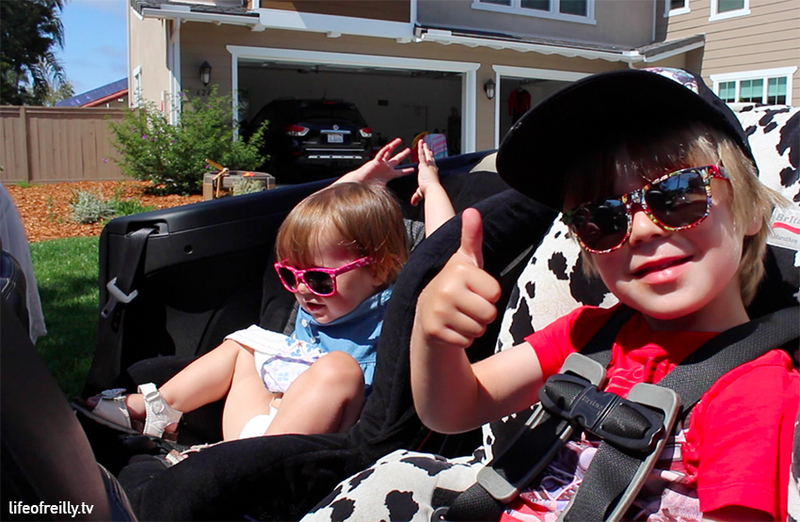 The convertible was amazing – but remember to keep those kids warm in the back!! Oops! Ok, before you get to the Golden Gate Bridge, make sure you try to rent a convertible for your Road Trip. Having the top down makes it feel as though you’re really travelling and connecting with the towns and cities that you drive through, rather than watching it all through a rectangular piece of glass. It’s great to feel the temperature change with the landscape, as it often captures the mood of the place you’re driving through. We found that choosing a convertible over a standard car was only $50 extra for five days, when we booked through Dollar. I’m not sure if we were just lucky with a promotion, but give it a try – it might not be as much as you expect! Dylan still talks about having a convertible in America! He’s going to be disappointed on our next trip!! 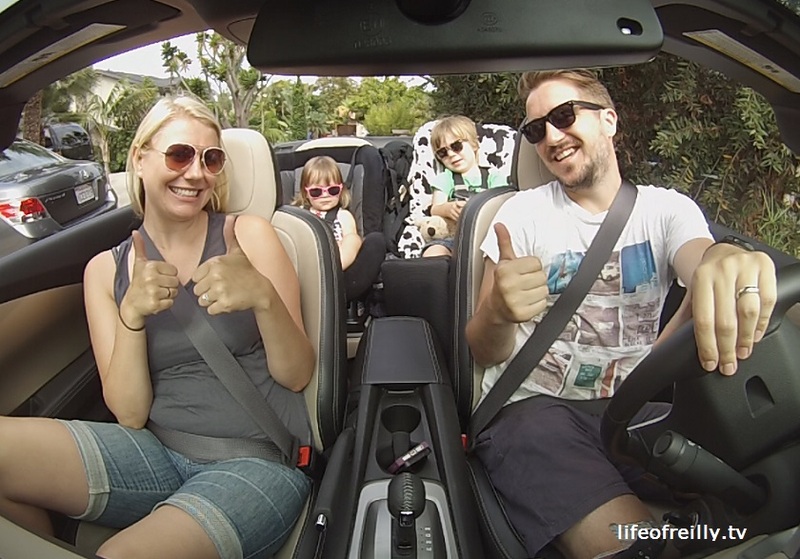 Was it worth getting a convertible when you have small children? Yes and no. Yes: it’s something different and fun; they liked it when we drove under 10mph. No: With a roof in the boot (trunk), there’s less room for luggage and a travel cot (pack and play) so it’s quite tight; they didn’t like it when we drove faster than a child on a bike; the back gets really cold, even in the Californian sun (we found this out the hard way and only realised that they needed jackets and blankets on when we got past Monterey – oops! ); you need to put sunscreen on the kids before you leave; it’s frustrating to drive Route 1 with the roof on when you have a convertible, so you kind of wish you didn’t have one! Overall: Would we choose a convertible again despite the big list of negatives? Hell yeah! It was fun to drive around with the top down, even if it was just for an hour each day. Just remember to snuggle up those little ones in the back. There are a few things that you should book before you jump into your car and leave modern life for three days (it really will feel as though you’ve gone back in time, especially during the first 48 hours). Yes, Big Sur is located just a few hundred miles from the global headquarters of Facebook and Apple, in one of the most advanced countries in the world, but it really is in the middle of nowhere – with no mobile phone reception, let alone internet – so there’s no way you can reliably book stuff. First, book your accommodation for both nights. You should be able to find a normal priced hotel around Santa Barbara but, just outside of Big Sur, the hotel owners know you have fewer options and hike up the price. We paid £92 ($142), via Expedia in the end, which was the cheapest priced room in the region. And it was a low-end hotel/motel, so it was totally not worth the money at all, but you need somewhere to sleep! The other thing about fewer hotels – and people knowing that you should book ahead – means that there isn’t much scope for turning up and expecting a room somewhere. We saw people, who hadn’t booked ahead, running in and out of every hotel reception looking for a room – even at our hotel! They said they were going to sleep in the car! You wouldn’t want to do that with kids in the back! 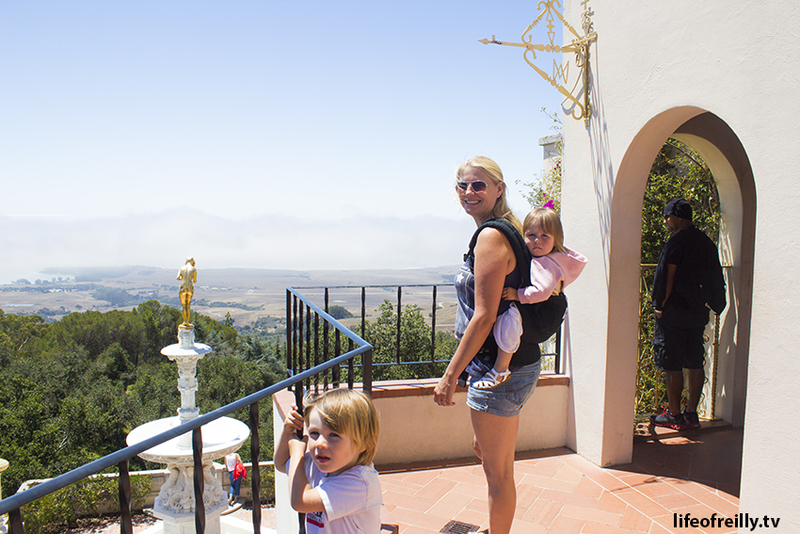 There are some special views from Hearst Castle and lots to see on the “ranch” as he used to call it! The other place you should book before you leave is Hearst Castle. Yes, they recommend that people should book ahead of time on their website but we weren’t certain which tour we should go on – and, we didn’t think that every good tour would get booked up for the times that we wanted to go. We also thought that we’d be able to book it at the hotel the night before…but with no 3G, and no working hotel wifi – it was impossible! When we arrived at the castle, all of the tours were booked up and we had to go for a later tour – and not the one that we really wanted to do, either. So, avoid this by simply booking ahead – you’ll thank us if you do! 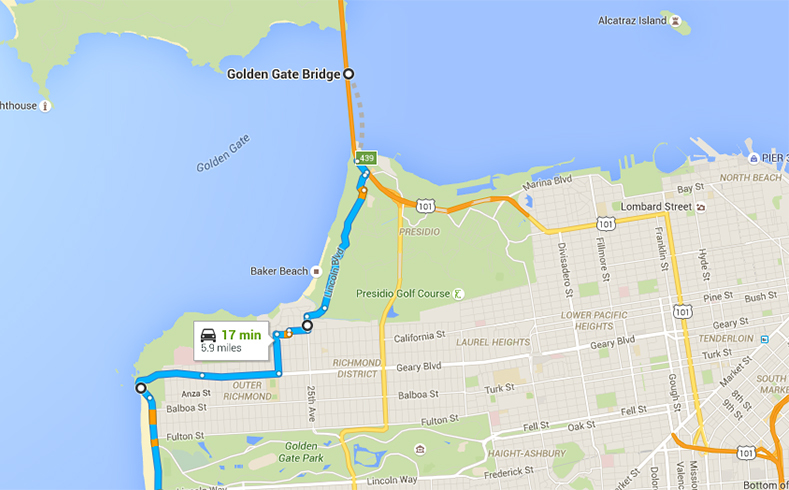 Aim to get to the Golden Gate Bridge as early as you can. We went for 10am to avoid rush hour traffic going out of the city but we could have probably left San Francisco at 9am and been ok.
We ended up getting there just after 10am and then didn’t actually start the drive until 11.30am, which meant that we we had lost a good amount of valuable driving time, straight away. Aim to arrive at the bridge around 8am so that you can hit the road by 9am. 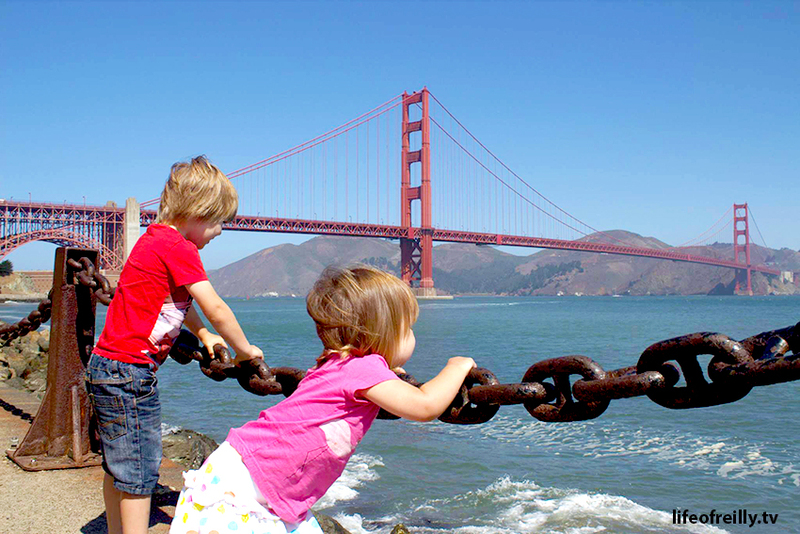 Get some pictures at the bridge, but don’t go to the Vista Point on the Marin side of the Bay: it’s packed and not a great shot. Head down to the beach off Old Mason Street. You’ll get a much better picture there and it’s far less crowded. We found a free parking spot just before the beach and took our pictures next to the road, which you might choose to do if you already have the beach shots. Once you’ve taken your pictures, jump in the car with your selfie stick and get some cool shots crossing the bridge. You’ll then turn around in the Marin Vista car park – where you’ll turn around (and at the same time thank us for helping you avoid the chaos here). You’re now ready to head south – the same direction you’ll be travelling for three days!!! Head down to the beach near Mason Street to get the perfect shot of the bridge or take some from the promenade, like this one. It is a very real possibility that you could get a $70 fine just seconds into your epic Road Trip. The Golden Gate Bridge is a toll road but you don’t pay with cash as you cross anymore. It’s more like the London Congestion Charge where your number plate is photographed and a toll is attached to the car. There are loads of places and ways to pay the toll but doing it online (here’s the link for you) is the easiest way. It’s also best to pay the toll a few days before – the biggest reason for this is that you only have 48 hours to pay it and there is hardly any 3G or wi-fi once you hit Big Sur! The official way to drive Route One is to stay on it (or the Historic 101) from San Francisco to San Diego BUT after you get off the Golden Gate Bridge, the Pacific Coast Highway is a four-lane road which gets snarled up with traffic. It’s not exactly the way you’ll want to start the drive of a lifetime, so we jumped off and headed towards the Ocean as soon as we got out of Golden Gate Park. It did feel as though the Stop Signs and traffic lights were never going to end at one point, but it was all worth it when we got our first glimpse of the water. We continued along Great Highway Road and enjoyed the panoramic views of the sea along the flat road. Every mile or two, we stopped at traffic lights to allow surfers to race into the water. There’s no mistaking that you’re setting out on a real Californian experience with these sights and sounds. You’ll join Route 1 just past Daly City and wind your way down to Santa Cruz. 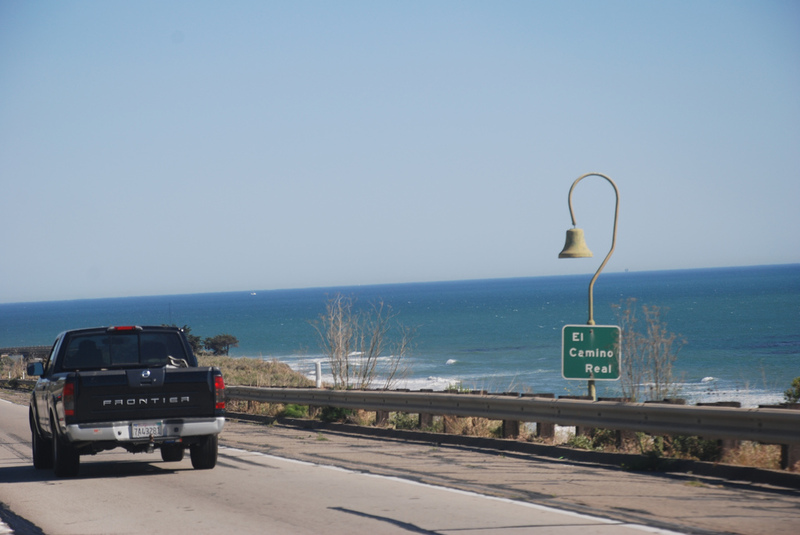 The El Camino Real bells line the Pacific Coast Highway. Photo by Eric Chan on Flickr. Now you’re on “The One,” you can get your kids to start looking out for the El Camino mission bells which are on ‘shepherds crook’ posts along the whole route to San Diego. They were placed on the highway in 1906 to commemorate the old El Camino Real (The Royal Road) trail which Spanish settlers created in the late 1700s to link the 21 California missions along the entire coastline. Over the past century, more than half of the 450 iron bells have been stolen, vandalised or fallen into disrepair. Don’t worry though, in the 1970s and 1990s many were replaced, so you should be able to spot some and take a few photos! After driving along the empty coastline for two hours, it was nice to hit a real city again. Santa Cruz is the original surf town: three Hawaiian students shocked locals by riding waves here in 1885 and, in doing so, became the first people to surf in the USA. It’s also the home of surfer, and inventor of the wetsuit, Jack O’Neill. Yes, that O’Neill. As you can see from our timings, because we left San Francisco really late. We didn’t have time to walk along the famous Boardwalk from The Lost Boys movie. Instead, with two starving kids – and two very hungry adults – we ran into the first diner we came across and ate lunch as quickly as we could so that we could get back on the road again. It was a shame because the boardwalk was buzzing with tourists – and locals – who were all looking to make the most of the fun that the city has to offer. Look out for the 90-year-old Big Dipper which is still holding its own against the modern amusements. We spent an hour in Santa Cruz, and left at 3pm. You should leave two hours – for lunch and sightseeing – and get back in the car at 1.30pm. This will get you to your next stop for the times below. We’d been to Monterey to visit family there several times before, so we didn’t stop here during this Road Trip. Monterey is a quaint place to visit, with its’ seafood restaurants and fishing village vibe. It’s home to Cannery Row, where John Steinbeck based the novel of them same name. 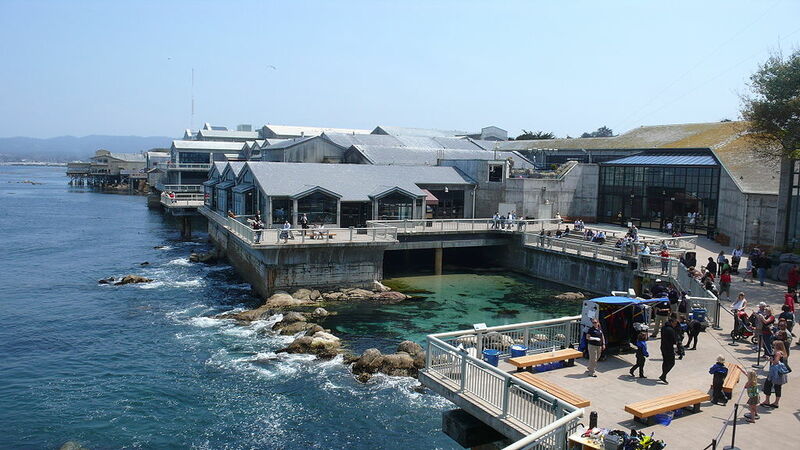 It’s home to the famous Monterey Bay Aquarium but, unless you’re going to do Route One with a stopover here, you won’t have time to visit it because it takes a whole morning or afternoon to get around. You could easily choose to stop here, rather than the fast-paced Santa Cruz, for lunch though. If you do – and you have some time to spare – you could also visit one of the most picturesque – and famous – PGA Golf Courses in the world: Pebble Beach. The famous links course is situated within, what’s called, “17-mile-drive” – a scenic route around the rugged peninsula which, believe it or not (!!!! ), is 17 miles long! With its rugged coastline, ocean views and varied wildlife, it’s like a mini Route 1 roundabout! It’s set within a gated community, so you’ll either need to know someone who lives in one of the mansions, or pay the $10 fee to be allowed in. The roads out of Monterey are straight and filled with expensive sports cars but the modern world seems to fall off the side of the cliffs, and into the ocean, with every mile that you drive south from this point. Before you know it, it’s just you. The road. And, the ocean. Gone are the Starbucks’ and fast-food chains. Even the gas stations and motels seem to suddenly disappear. There’s no Las Vegas style sign that says, “Welcome to Big Sur” but as you start climbing above sea level, the roads get windier and the landscape becomes more dramatic. You’ll quickly know when you’re there. The panoramic views open up around you. The waves crash beneath sheer cliff-drops next to the road, and the hot Californian sun begins to cool. The land becomes rustic and wild and it really feels as though you’ve got a seat in nature’s best interactive theme park. It got so chilly that we needed to put the roof up to stop the children from freezing in the back. We were also starting to get red faces from the sun and now the wind. We would’ve probably kept the top down if we didn’t have the little-uns but it did mean we could turn up the stereo and find an appropriate soundtrack to the stunning scenery around us. 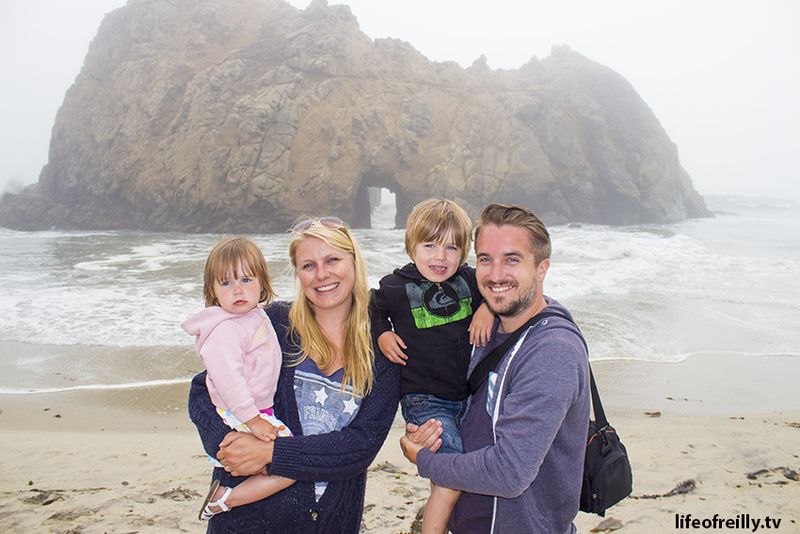 There are scores of small parking areas through Big Sur to allow you to stop, take in the scenery and capture a few memories with some photos but we needed to keep our pit-stops economical. The first big landmark we stopped for was, surprisingly, a man-made one: Bixby Bridge. There’s a smaller version of the bridge that you cross before Bixby, so we were looking for a place to turn around, but before we knew it, the real bridge was in-front of us and we were ready to pull over. 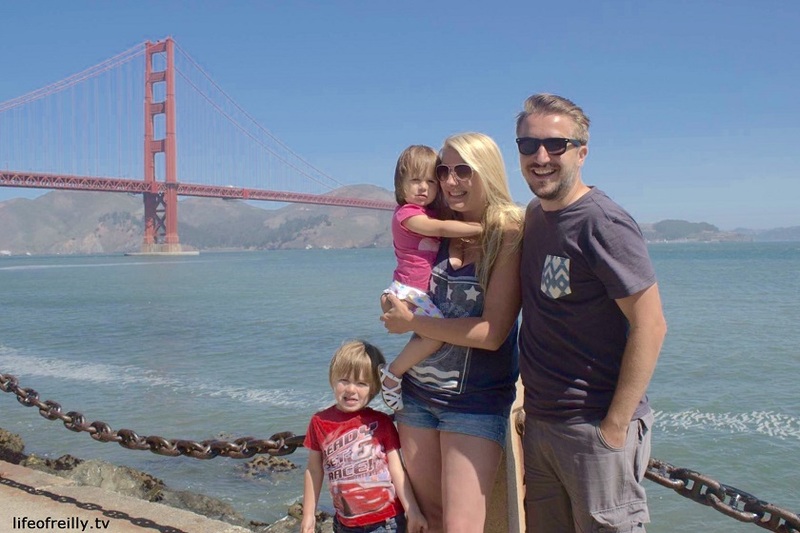 I wouldn’t say that I’m a bridge lover, but I’ve always found the Golden Gate Bridge compelling for some reason – and the pictures I had seen of Bixby Bridge looked really cool, too. It was amazing to see something so well constructed in the middle of nowhere. The best part…is that the bridge totally lives up to the hype. It takes your breath away when you see it in person – and it will look amazing in any photograph that you take! Pfeiffer Beach has to be seen to be believed! Check out our Big Sur video to see more. One of things we didn’t think about – or appreciate – when we’d heard stories or read articles about Highway One was the coastal fog that’s around. We thought it would just be on certain days, or at certain heights, but from Bixby Bridge all the way to San Simeon (where we stayed the night), we couldn’t see that far into the distance – even though it was July! It was a bit disappointing, at first, but then it all begins to add to the mystique of the drive. 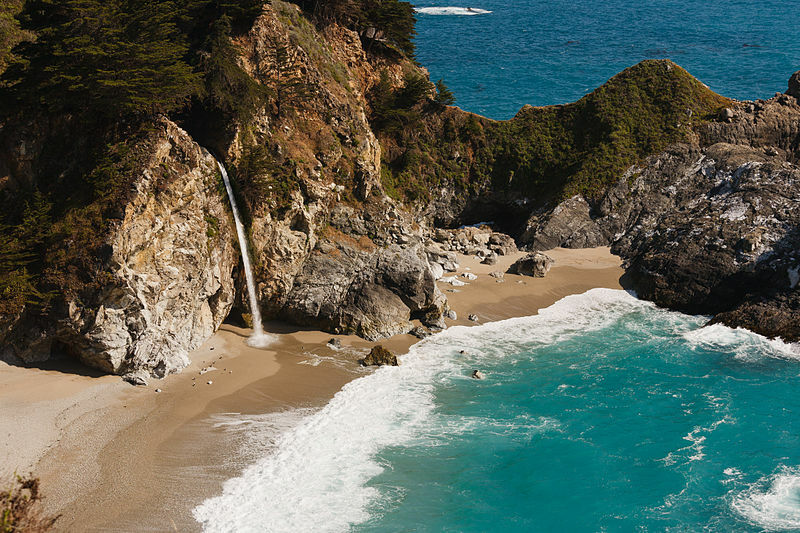 We also think it’s Big Sur’s clever way of making you want to return again and experience a completely different trip. Our next stop was Pfeiffer beach, with it’s purple sand and famous Keyhole Arch which invites big waves to build and crash through it. We had also been told that it was hard to find, but we scoffed at the advice of family and friends believing that anyone can easily find anything in the USA. We should have listened to Aunt Connie! It’s really hard to find and we drove past it twice, even after asking for directions. There are no signs to the famous beach – and GPS doesn’t take you to the right place – so bookmark this page now so you can find it later. 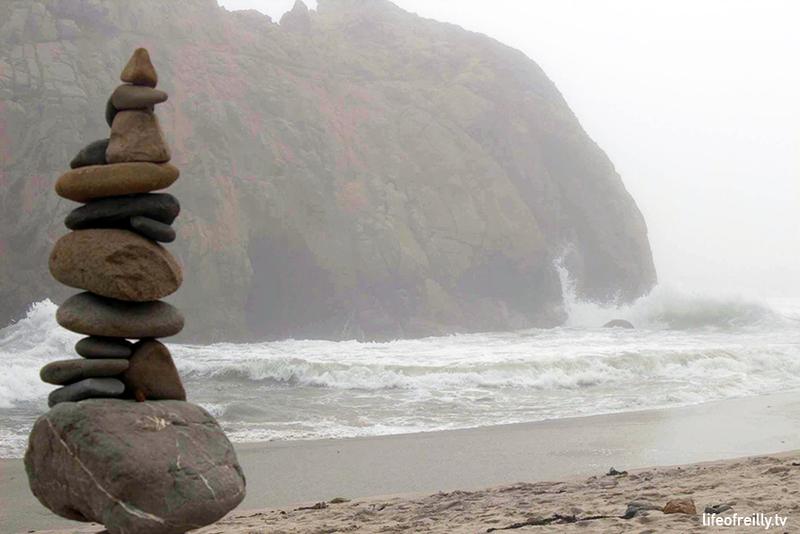 Make sure you save this page to make sure you can find Pfeiffer Beach when you’re doing your road trip! If you miss it, like we did, then you’ll know you’ve gone too far because you’ll end up getting to “Big Sur Center.” You can turn here and try again! Be warned, the drive down to the beach is for confident drivers only. Alicia was yelping as we drove down and saw other cars heading our way! When you get down to the beach you’ll be asked to pay $10 to park, so make sure you have some cash with you. It’s well worth the money as it felt like being on another world. It was really peaceful and the rock formations and waves are stunning. We spent 45 minutes there, which felt a little rushed when we got our kids out of the car and back in again. So, again, leave San Francisco on time and you should be fine! This was the point that we started panicking about how late we’d left everything. It was dinner time, the kids were doing well, but would be getting hungry very soon. The sun was beginning to go down…and we were still two hours away from our hotel…so we raced through the rest of Big Sur to get them fed and watered. If we weren’t in such a rush, we would have definitely stopped at McWay Falls and some of the other turnouts along the route. If you stick to our recommended timings though, you should still have time to see these sights. Big Sur Bakery is just next to the “Big Sur Center” which you might have turned around in to find Pfeiffer Beach. It would be a great place to pick up some freshly baked food to keep you going until dinner. If you’re running late, like we were, they also serve “normal food” for breakfast, lunch and dinner. Expect to pay top dollar for the privilege of eating in the middle of nowhere though: Soups start at around $10 and wood-fired pizzas start at more than $20. A mile south is Nepenthe, which has a cafe and restaurant with a view, on the right hand side. We didn’t quite know where this place was when we drove past, but we really wish stopped here for dinner as it would have been perfect with our super-late timings! A little further south, on the left, is the Henry Miller Memorial Library. Yes, it’s a library, but in Bug Sur, you know it’s going to be different. Stop in for a cultural, quiet break to browse some books or walk around the gardens with a tea or coffee, which you have to make yourself (of course). If you don’t need to stop for food, McWay Falls is next. Unlike Pfeiffer Beach, there is a sign to McWay Canyon from Route 1, but it’s hidden on a sign for Julia Pfeiffer Burns State Park (Confusing, huh? Two State Parks with similar names) and it’s a left turn, which feels wrong when the ocean is on the right. We couldn’t afford to go wrong so late in the day so kept on driving. You might get lucky and find a spot to park just before your turn off Route One, but if you don’t have the time to look for a free spot, follow the signs and you can pay to park in the official spaces. It’s just a short walk, then, to see the 80 foot hight falls. Your photos will be stunning at any time of the year – even with a drought – because the water constantly flows from underground springs. Fact of the day: the water used to fall straight into the ocean until a fire, and then a landslide in the early 1980s, created the sandy beach that you see today. The beach is too dangerous to get down to, due to cliff-falls and erratic tides, so stick to the path. 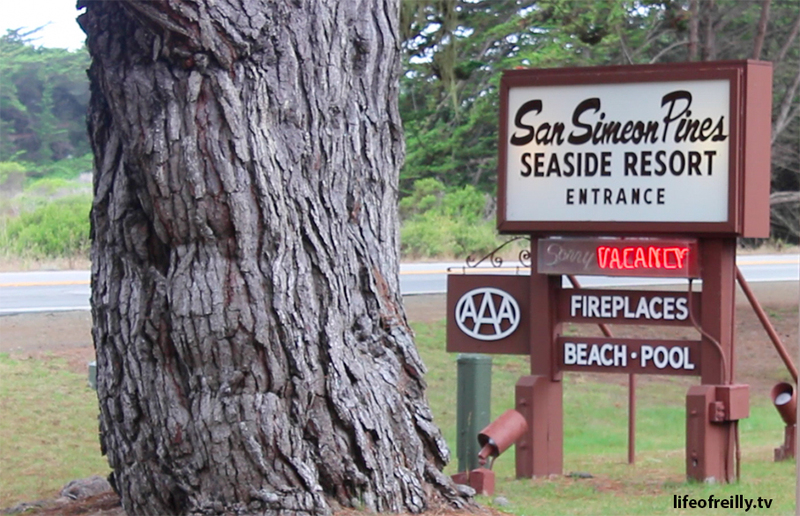 An example of the hotels in San Simeon. The old school hotels should be embraced – you can go to a Hilton anywhere in the world! The coastal fog was around all day but it was when the sun began to set that it felt more desolate and overbearing. The drive seemed like a real effort through the southern end of Big Sur. The road seemed windier than ever, a queue of cars was building-up and getting closer together – almost like a train convoy – and we were all feeling very tired and wanting food, some rest and a bed for the night! I even started to get worried that we might miss checking in to our hotel because the reception probably wasn’t 24/7 (I was right, it wasn’t) but we did make it to San Simeon in the end! The hotel was very basic and looked like the Bates Motel but we knew that’s what it would be like and, to be honest, this is what adventures are meant to be like. It would be boring if it was a standard Hilton or Holiday Inn that you could find anywhere in the world. There was no restaurant in our hotel so we drove to downtown San Simeon which, we’d just driven past and knew was definitely serving food, rather than going to nearby Cambria. 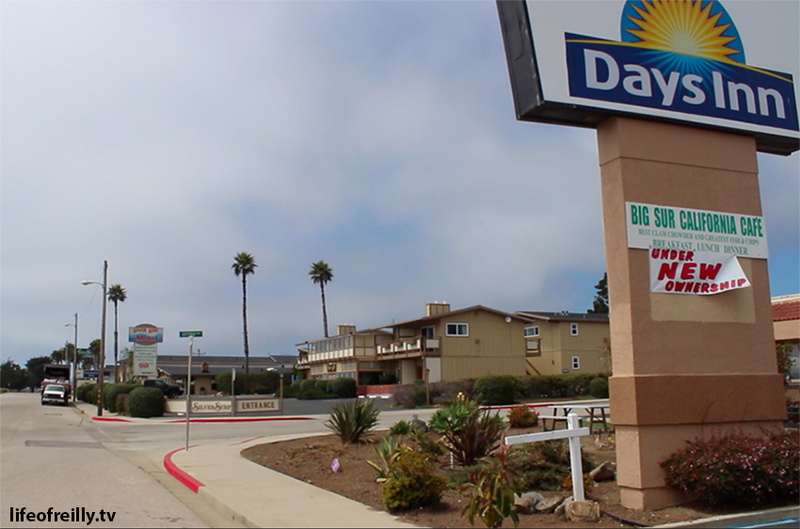 The main strip of hotels in San Simeon. Make sure you book ahead. We should have gone to Cambria!! The restaurants in San Simeon were all linked to the hotels. The only nice looking one had a two-hour wait. The only one that could fit us in was a dodgy diner with incredibly over-priced food ($15 for a burger) which wasn’t very good! We think you’d do better if you travel a little further south for food, unless you’re in one of the nice hotels. The kids were in a weird mood. Dylan was going hyper with the lack of sleep and Samantha began to cry over anything and everything. At around 9.30pm, we climbed into our two double beds – the lads in one and the girls in the other – and we were all asleep within minutes. It had been a long, tiring day – and we were now sleeping in the middle of nowhere – but we’d travelled so far and done so much in a relatively short time. I think we all fell asleep with smiles on our faces. Click here to read about our second day of the Road Trip: from San Simeon to Santa Barbara.